Just ask anyone who's seen Spiderman 3: Good ideas seldom survive bad execution. The developers at Microsoft had some great ideas while designing Vista, but poor implementation turned many of those great concepts into lousy, annoying features. To be fair, Vista inherited most of these well-intentioned flaws from earlier versions of Windows--but it either failed to fix them or didn't even try. Here are ten of Vista's most irritating flops, along with quick fixes and workarounds. Let's start with one that's absolutely unique to Vista, and almost universally hated by those who use it. You can turn UAC off completely in the User Accounts control panel. People do some things in Windows--such as install destructive applications or edit the Registry--that deserve a stern "Are you sure you know what you're doing?" warning. Such situations may even warrant your having to prove you're an administrator before you're allowed to continue. But Vista's User Account Control (UAC) fails to offer enough feedback to users; often it gives you no way to know why a given act is considered dangerous. Even worse, Vista's designers went overboard, forcing people to click through a UAC prompt to set the clock or manually start a backup. The result: People get annoyed and learn to ignore UAC, effectively removing any protection it might provide. Here are three imperfect ways to stop UAC annoyances. One minor problem they all share is that every so often, when you boot, Vista will warn you that the UAC is off. You can just ignore the warnings, in much the same way you've already learned to ignore UAC itself. 1. Just turn it off: This easy fix works well in an administrator account, but it renders standard accounts almost unusable. Select Start, Control Panel, User Accounts, and click Turn User Account Control on or off. 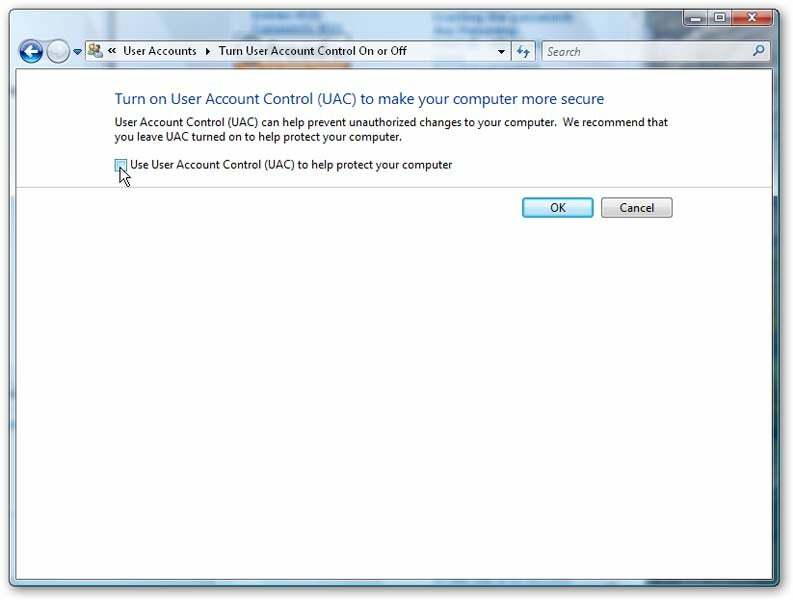 Select Continue at the UAC prompt, and on the next screen, uncheck Use User Account Control (UAC) to help protect your computer. Click OK and reboot. TweakUAC lets you turn off the annoyance on your own account, while leaving it on for other users of your PC. 2. 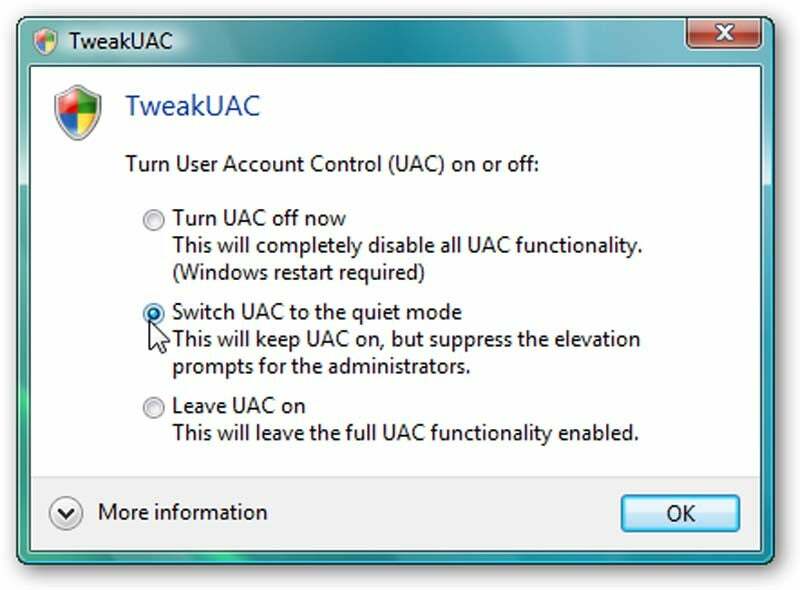 Use TweakUAC : This free program can turn UAC off for administrator accounts while leaving it on for everyone else, which is a relatively safe and convenient compromise. Just run the program, select Switch UAC to the quiet mode, and click OK. If you don't mind taking matters into your own hands, you can tweak a variety of settings using the Security Policies editor. 3. Fine-tune your system's UAC settings: This works only in Vista Business or Ultimate. Select Start, type secpol.msc, and press Enter. 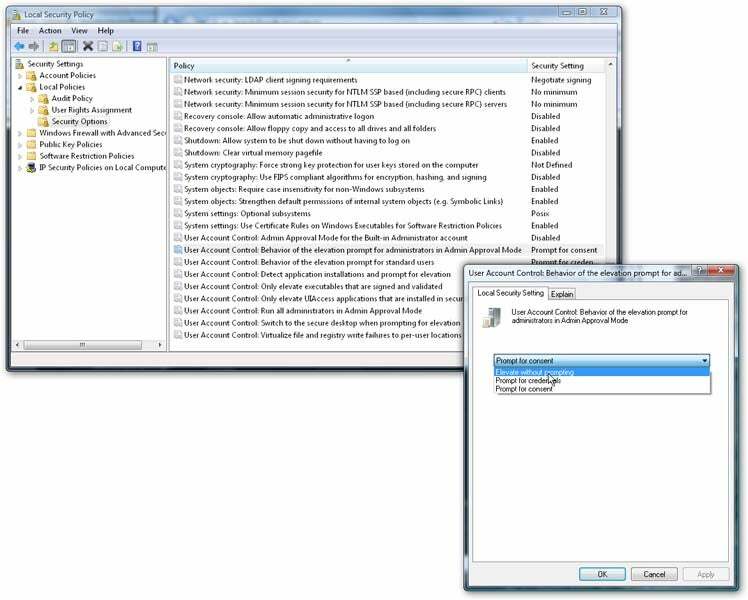 Navigate the left pane to the Security Settings\Local Policy\Security Options folder. In the right pane, scroll down to the bottom for nine options controlling how UAC behaves. If you're not sure what these settings change, see the helpful guide at Walker News.